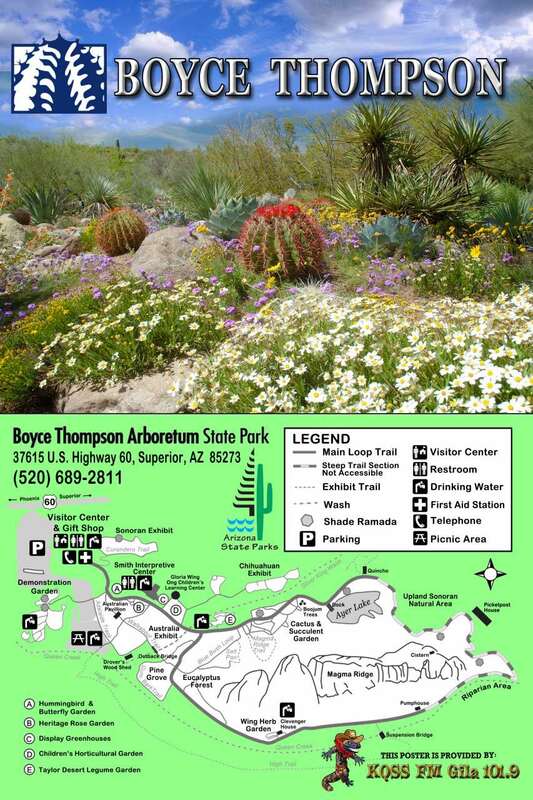 Boyce Thompson Arboretum State Park is a jewel of the Arizona desert. Located near the town of Superior south and west of Phoenix, it is very worth the drive no matter what time of year. Sadly, there are many in the greater Phoenix area that not only haven't visited, but aren't even aware of it. It is a wonderful place to see butterflies. Many of my butterfly and insect pictures were taken there. And to show what a wonderful location, I have whole galleries of pictures taken on single day outings called A Day At Boyce Thompson. The poster (sponsored by KQSS, Miami-Globe) at the left shows a very good trail map of the grounds. And I have some bragging rights with this poster (along with permission to display it here) because the photo is mine and it is in the gallery below. This gallery of pictures were all taken on a single day - April 2, 2005. Though any time of the year is a great time to visit, the colors peak during the spring.